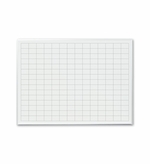 Wall mounted, dry erase grid boards from OptiMA let you create your own dry erase scheduling boards, production boards or sales charts. Each OptiMA magnetic dry erase grid board is created with our exclusive Opti-Print method which uses only the best, non-ghosting dry erase writing surface in the world and every unit is proudly Made in the U.S.A. 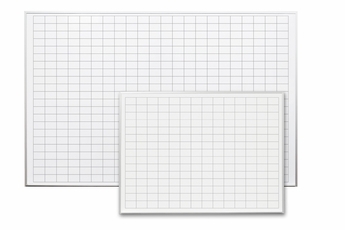 Select from four standard sized dry erase boards; 2x3, (3x4) 32" x 45", 4x6 and a much larger 4x8, with a selection of up to four different grid patterns. The grid patterns have black lines that are approximately 1/16" thick. Another OptiMA Exclusive! 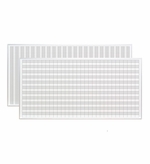 Our 3x4, 4x6 and 4x8 grid boards are now available with either variegated rows or columns. That means that every other row or column will be shaded in light gray to make reading your grid board a snap if you're using them for production or scheduling. It is a lot easier to follow the rows when every other row is shaded especially when you get a larger unit. The writing surfaces are magnetic receptive so you can use magnetic accessories such as magnetic data cards and colored magnetic ribbons. If you're not interested in using magnets we can also make any of our grid boards non-magnetic. Non-magnetic units are less money but have the same dry erase writing surface. Contact customer service for assistance. 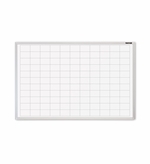 Magnetic dry erase boards with three popular different grid patterns from OptiMA. Actual size of 32" x 45.5" - 3 Grid patterns Magnetic Receptive with aluminum trim. Four grid patters for scheduling jobs or create planning boards, sales graphs and more. Extra large Grid boards. Magnetic receptive with permanent lines.